As a loyal sponsor, you know this event is the largest gathering for Palestine in the country. Attendance has increased yearly and we expect more than 5,000 guests this year. We offer different sponsorship and advertising packages, which ensure you will reach a wide audience. ​Be a part of this historic event again by sponsoring the only Muslim organization working for Palestine in the U.S. From multiple programs in the community to national campaigns and media work, AMP has taken activism to a whole new level. By sponsoring this year’s conference you have the opportunity to advertise your organization and business to guests from all over the nation. Dozens of vendors and businesses participate in the AMP’s conference each year. The AMP conference represents a diverse group of people coming together to discuss, learn, and socialize together under one common theme: Palestine. This event also acts as a niche market for businesses. The bazaar provides an opportunity for businesses to cater to the needs of their customers. Over the years business owners have seen the AMP conference as their chance to market to a wide audience, and to build their clientele and customer base beyond their expectations. Sponsors and advertisers have seen a great return from their investment. Participating in the annual national AMP conference is a once-in-a-year opportunity that can have real impact on your exposure and profitability. Please review the various packages below and contact us if you need more information. Please inquire about customizing a package that suits your business needs. Who exhibits at the AMP conference? If you want to realize new lasting customer relationships, and extend your company’s recognition then you’ll want to take a booth at the AMP conference. If you are a clothing retailer or bookstore you may want to consider taking two. Here is a sample of the types of businesses that exhibit at the AMP conference. Non-profit organizations: charitable, schools, colleges, etc. Services: travel, insurance, Islamic finance, etc. Media: magazines, newspapers, radio stations, etc. Retailers: Islamic clothing, abayas, hijabs, T-shirts, CDs, books, DVDs, Palestinian memorabilia, etc., packaged dry food and sweets, etc. No fresh food vendors are allowed Due to Health Department regulations, no fresh food vendors are allowed. One booth: $400.00, two or more booths: $50 discount for each additional booth. Market your business or product extensively at the AMP 2018 conference and reach thousands of attendees. Marketing through AMP’s conference reaches far and lasts much longer than the event itself. 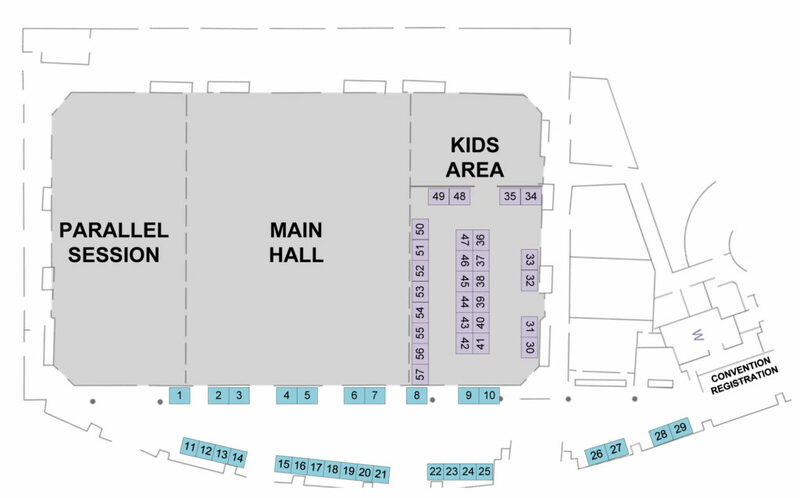 Two complimentary bazaar booths in a prime location of the conference center. Complimentary registration for up to 15 individuals from your business/ organization. Twocomplimentary hotel rooms for 3 nights each during the conference. A full-color, full-page ad on the back (out/or/inside) cover of the conference program book. Business name/logo on the conference tote bag. Logo on the conference lanyard. Business/organization name in any advertisement for the conference. Recognition as the main sponsor during the inauguration ceremony and during the entertainment session in the last night of the conference. One complimentary bazaar booth in a prime location of the conference center. Complimentary registration for up to 10 individuals from your business/organization. Onecomplimentary hotel room for 3 nights each during the conference. A full-color, full-page ad in the conference program book. Business name and logo on the conference tote bag. Audio/visual advertisement before the beginning of a main session/ each one of the conference 3days (up to 30 seconds ready to use video). Complimentary registration for up to 5 individuals from your business/ organization. Complimentary registration for up to 3 individuals from your business/organization. Custom Marketing Opportunities are available on a case-by-case basis. What sort of presence do you want at the AMP conference? Where do you want to direct your marketing energy? In addition to providing AMP’s tried and true marketing assets, we can develop a custom marketing package for you. Using the advertising, sponsorship, and exhibitor opportunities listed in this booklet as well as social marketing through Facebook, Twitter, and the like, AMP can help you get your business recognized and well on its way to success, insha’Allah!